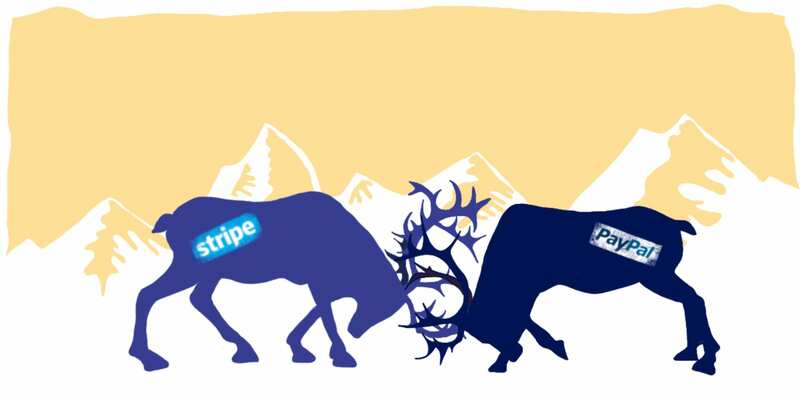 PayPal versus Stripe - why Stripe wins 9 times out of 10. Deciding between PayPal and Stripe for your online payment gateway? Drawing on our insights from millions of transactions and customer feedback, we think there’s one clear choice. If you want to take online payments then choosing the right payment gateway is critical. It can make a big difference to your running costs, your administrative time and your customer experience. When PayPal first arrived way back in 1998 it helped revolutionise online sales and e-commerce. They’re a huge, globally recognised brand that serve 218 million account holders. Stripe are the (relatively) new kids on the block - having been founded in 2010. From their beginning, Stripe have focused on slick customer experience, intuitive design, and a very competitive pricing structure. We’ve facilitated millions of transactions on Bookwhen with both PayPal and Stripe. Based on feedback and insights from hundreds of users, there’s one clear winner - Stripe. This article explains why - 9 times out of 10 - Stripe should be your choice. We’re not affiliated with Stripe in any way - we just know our customers are always happier with them. Before starting this list it’s worth pointing out that both Stripe and PayPal adhere to the highest international security standards for payments. There’s nothing to separate the two in this respect. Also, Stripe is not available in as many countries as PayPal yet, so this might not even be a choice for you. Much slicker. Below are screenshots of the payment forms. There are 10 mandatory fields in PayPal’s form and only 3 in Stripe’s. Longer forms take longer to complete and create more opportunities for your customer to mistype a piece of information - potentially leading to a failed payment. With Stripe, returning customers can simply pay using their mobile phone number - super simple! No sign up process. 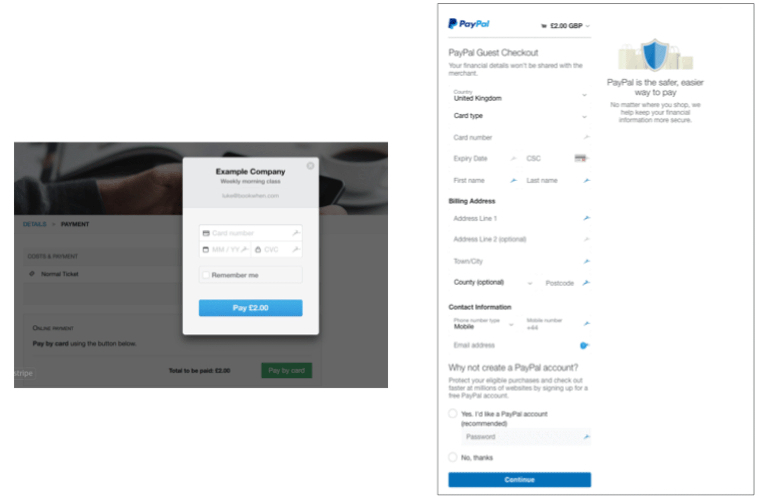 PayPal will try to encourage your customers to sign up in order to make a payment, often placing the signup link above the card payment option. In some cases PayPal will only give the option of paying via PayPal. This slows down checkout and can sometimes stop it all together. With Stripe, there’s no club to join - just a simple card payment (as in the screenshot above). Fees are cheaper or the same. 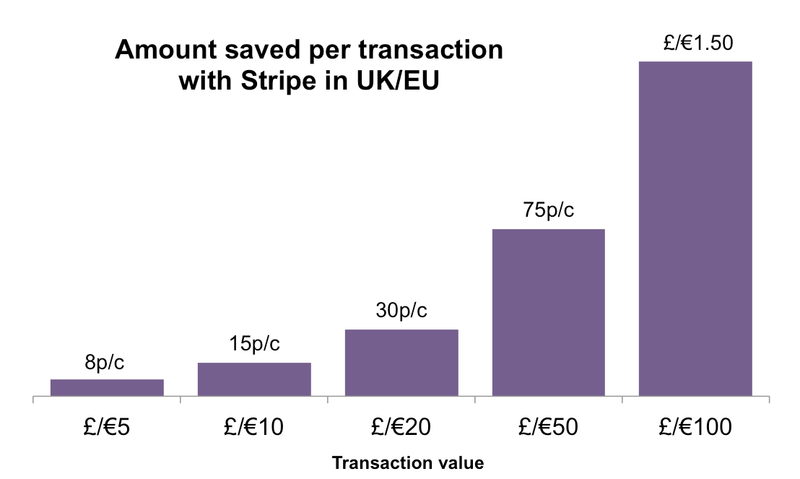 In the EU (including the UK) Stripe’s fees are considerably cheaper. In transactions between £5 and £200, PayPal is between 28%-100% more expensive in terms of fees, and this difference increases as transactions increase. For typical Bookwhen users this could save anything from £25 (Lite) to £150 per month in fees (Standard), just for switching to Stripe! PayPal are also more expensive when it comes to payback charges and certain other cards such as American Express. Reliability. We process millions of dollars of payments on Bookwhen each month, so we get regular feedback about reliability. We’ve never had an instance of a Stripe payment failing (apart from card issues). Dashboard reporting. In comparison to PayPal’s dashboard, Stripe’s is much slicker and far more responsive. We think you can get the answers you need in a fraction of the time, and more intuitively. Much faster to set up time. Stripe is very straightforward and there are no baffling range of membership tiers - just one simple signup that generally takes less than 15 minutes. Stripe are innovators. They support an increasingly wide range of alternative payment methods (as opt-in choices) such as direct bank payments in the US, Apple Pay, Bitcoin, a whole range of European payment methods including SOFORT, iDEAL, Giropay, SEPA, Bancontact and Giropay and Alipay in China. Innovate with Bookwhen. Stripe provides some extra features to you as a Bookwhen user. For example, if you run a franchise business you can connect your franchisee’s Bookwhen accounts to take commission on their bookings. And in the near future (early 2018) we’ll be offering the ability for you to take subscription payments from your customers. But… PayPal still allows you to accept payments in, well, PayPal! Some customers prefer this as it keeps costs off their regular bank account. PayPal will certainly continue to hold the crown as the most recognised and established payment gateway on the internet for years to come. Their familiarity and brand recognition means they often feel like the safest bet - both for you and your customers. And they’re still a dependable choice. However, in our experience it’s Stripe that comes up top across all areas, time and time again. The speed and direction in which they’re innovating gives us confidence they’re your best bet when it comes to deciding a payment gateway for your business.